In recent years, more companies have begun to offer the option to work off-site, and the number of entrepreneurs starting small businesses has increased exponentially. Whatever the cause, more and more people are opting for the work-from-home lifestyle. Inevitably, once the initial shine has worn off of working from the couch or kitchen table, those of us who work from home all come to the same conclusion: a home office is pretty necessary to working efficiently. The key to building a home office you’ll love to work in is to make it both functional and enjoyable at the same time. An old desk crammed in a windowless room, though workable, probably won’t be a space where you look forward to spending your days. It’s all about figuring out how to blend the things you love with the things you need. Here are 15 ways you can make sure your new home office is everything you ever dreamed of. 1. Prioritize natural light and a view. These two things often come together in the form of a window! You don’t have to set up right in front of a window, but it sure doesn’t hurt. Make sure you are at least able to look out the window from wherever you set up. It helps to defeat the mid-day blues! Plus, getting all that natural light is sure to perk you up. 2. Don’t underestimate the power of a nice light fixture. If window space and natural light are lacking in your office space, find a lamp that compliments your style and go for a low wattage light bulb that will be easy on your eyes. Even with a big window nearby, you’ll need a light for late night work or overcast days. 3. Level up your “couch office” with a sturdy lap desk or over-arm table. If you don’t have the option of building a truly dedicated home office space, and often find yourself working from the couch or your bed, find a good adjustable lap desk. Using a lap desk helps to improve your posture, and has the obvious bonus of not having your laptop overheat while you balance it on your knees. Another option is to purchase (or build!) a desk that fits over the arm of your couch. These tables give you a bit more height, and can also blend nicely with your room’s décor without sticking out. 4. Liven up the space with plants and greenery. If I’ve learned anything from my mother-in-law (I’ve learned a lot! ), it’s that bringing the outdoors into the indoors can be a game changer. Not only will it add a lush vibe to your space, but plants will actually filter the air you breathe, giving you a literally cleaner, healthier, and brighter thinking space. Plus, depending on the variety you choose, they can be incredibly low-maintenance. And they make good friends. 5. Discover the perks of working on your feet. Find it hard to stay in one place while you work? Consider investing in a convertible or standing desk. Long hours spent sitting can really do a number on your back. There are tons of studies now that say standing desks can dramatically improve your health and well-being, simply by enabling you to move around, use your legs, and engage your core. They can be a bit of an investment, so do your research, but they can make a huge difference in your work life. 6. Keep your feet moving and blood circulating. If you use a standing desk you might also want to grab an ergo mat. These mats are made to encourage you to move your feet around, stretch your legs, and engage your core even more. It helps to keep you from getting too stiff or sore while standing all day. It may sound a bit over-the-top, but it’s a game-changer. 7. Keep your workspace clean and minimal. Whatever desk type you opt for, keep your desk space neat and tidy. 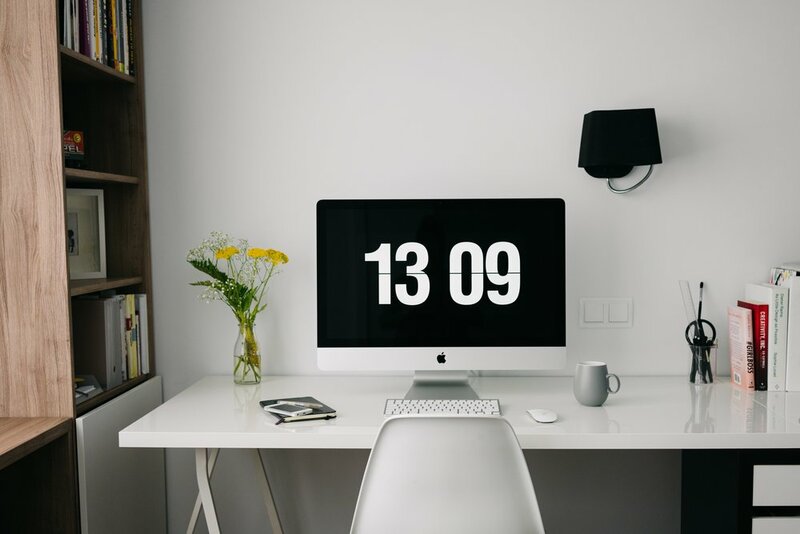 Ridding your work space of clutter is vital to a productive day of work. Disorganization is nobody’s friend. So pick a few select essentials to keep on top of your desk and stick to just those items. A file organizer, a pen holder, and lamp might be all you need (in addition to your notebook and computer, of course). Remember that you have vertical space to work with, too! Putting up a few floating shelves on your walls is a great way to keep your space elegant, organized, and easily accessible, without cluttering up your desk. 9. Keep those cords under control. Nobody likes dealing with tangled cords; it’s a logistical and aesthetic nightmare. Fortunately, it’s a problem easily dealt with by picking up a cord organization system at the office store. It’s worth the investment to save the headache of untangling your charger when you need to head out to a meeting! Don’t want to spend any money? Use a zip-tie to hold everything in place. It’s not elegant, but it looks a heck of a lot better than a sprawling tangle of wires. 10. Bring your personality into your work space. The fact that you’ll be working here doesn’t mean it should be devoid of design elements and character. In fact, it’s the exact opposite! If this is really a space where you intend to spend a good chunk of time every day, you’ll want to make it inviting! Hang up a cute print on the wall, display a favorite souvenir on a shelf, or print out a sentimental photo to frame on your desk. The more you like the space, the more likely you’ll actually use it! Get a small bin to keep near your desk so you don’t have to go wandering through the house to toss your trash out (or let it pile up on the floor next to you). 12. Be prepared for combatting distractions. If your workspace is in a high-traffic area of your home (ie: the living room), plan for the inevitable distractions that will come your way. Keep a pair of sound-canceling headphones in your desk drawer, and try to orient your desk so it faces away from TV screens. 13. Splurge on a ridiculously comfy, attractive, and comfortable office chair. You really want to take this one seriously as you’ll be logging countless hours perched in the chair you choose. Comfort should come first (make sure you have good lower-back support and that the chair adjustable), but style is important, too! Find a chair you can’t wait to plop down on, and you’ll find yourself inspired to start work every morning. 14. Create a secondary, less formal work-space. If you have the space for it, try adding a cozy reading area. An oversized chair and a reading table will give you options for moving around during your work day – options that aren’t curling up in bed or on the couch! You’ll remain productive, just with a little extra comfort! 15. And finally, work with what you’ve got. Low on space? Don’t forget to use the nooks and crannies in your house. Have a deep-set window? Tuck a small desk in there. Space behind your couch? Turn a couch-back table into a convertible desk. While these spots may not be the most ideal, use what you have and make it as functional as possible with some space-saving choices.